Kottayam is a city in the Indian state of Kerala. It is located in central Kerala and is also the administrative capital of Kottayam district. Bordered by the lofty and mighty Western Ghats on the east and the Vembanad Lake and paddy fields of Kuttanad on the west, Kottayam is a land of unique characteristics. Panoramic backwater stretches, lush paddy fields, highlands, hills and hillocks, extensive rubber plantations, places associated with many legends and a totally literate people have given Kottayam District the enviable title: The land of letters, legends, latex and lakes. The city is an important trading center of spices and commercial crops, especially rubber. Most of India's natural rubber originates from the acres of well-kept plantations of Kottayam, also home to the Rubber Board. Kottayam is also called as "Akshara Nagari" which means the "city of letters" considering its contribution to print media and literature. Kottayam Town is the first town in India to have achieved 100% literacy (a remarkable feat achieved as early as in 1989). English education in South India did actually start at the Old Seminary here at Kottayam in 1813. The first printing press in Kerala was established (CMS Press) here in 1821 by Rev.Benjamin Baily. The first college in the State (CMS College) was also started here at Kottayam in 1840. Maiden printed Malayalam-English and English-Malayalam Dictionaries were published from Kottayam in 1846 and 1847 respectively. The first and only Cooperative Society of writers, authors and publishers (SPCS), for publishing books and periodicals was set up here in 1945. Kottayam is the hometown of a vast number of books and periodicals and is the center of publishing business in the State. Kottayam is the first town in India selected by the Ministry of Environment and Forests, Government of India to be transformed as an Eco City. The Sri K R Narayanan, the former President of India hails from Kottayam District. Kottayam is the ideal take off point for visits to Peermade, Munnar, Thekkady, Ernakulam and the temple city, Madurai. It is also a gateway to the pilgrim centers of Sabarimala, Mannanam, Vaikom, Ettumanoor, Bharananganam, Erumeli, Manarcaud, and so on. Kottayam district is famous for its religious harmony. There are around 50 temples, 70 churches and numerous mosques in Kottayam district. 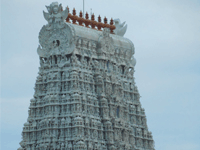 Some of the main pilgrim centers in this district are Ettumanoor Mahadevar Temple, Vaikom Mahadeva Temple, Thirunakkara Shiva Temple, Manarcad Church, Vakathanam Valiya Palli, St. George Orthodox Church, Vavar Mosque, Thazhathangady Juma Masjid etc. Kottayam is also famously called as the Gateway to pilgrim centers such as Sabarimala, Mannanam, Vaikom etc. Kottayam is the main centre of Syrian Christians in Kerala. Some of the main pilgrim centers of Kottayam district are given here . 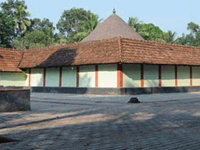 Ettumanoor Mahadevar Temple was constructed in the year 1542. This temple is located in Kottayam district. The deity here is Lord Shiva also called as Ernakulathappan and this idol faces the sea. The inner and outer walls are decorated with mural paintings whose themes are obtained from Mahabharata and Ramayana. One of the best wall paintings in India is the Dancing Shiva. Inside the temple lies a golden staff with an idol of a bull on top of it. The annual festival is conducted in the February month and concludes with the Arattu festival. A very important festival is the 10 days long ‘Ezharaponnana Ezhunallathu’. In this seven and a half elephants made of gold that weigh around 13 kgs are kept for public view on the 8th day of the festival. The 7 statues are each 2 feet tall with the small one having a height of 1 foot. These statues were donated by the Travancore ruler. 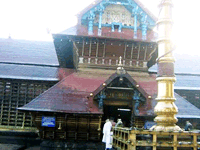 This temple is considered to have the wealthiest Devaswom. It is held in the months February / March. An important ritual carried out in this temple is the Thulabharam. For this ritual the offerings to the God are calculated based on the weight of the person. These offerings can be fruits, ghee, gold or any material. There is a huge lamp near the entrance of the temple and the devotees can offer oil to it. The soot that is collected from the burning oil is considered to have medicinal values. Vaikom Mahadeva temple is an important Shiva temple and is considered as one of the 108 Sivalayas that has been created by Lord Parasurama. It is one of the oldest temples of Kerala. The famous festival celebrated here is the Vaikkath Ashtami held during the month November/December. The Siva in this temple is popularly called as Vaikkathappan. 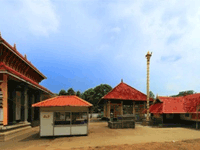 This temple is located in Kaduthuruthy that lies in between Vaikom and Ettumanoor. It is located on a hill top and is a small temple. The architecture of the temple is simple and this temple is considered as one of the 108 Sivalayas that has been created by Lord Parasurama. The three temples Vaikom Mahadeva temple, Ettumanoor Siva Temple and Kaduthuruthy Thaliyil Mahadeva Temple are considered as a powerful trisome and the people believe that one who worships all these three temples before 'Ucha pooja', are sure to get their wishes fulfilled. Adithyapuram Suryadeva Temple is the Sun temple which is dedicated to the Sun God, Adithya. Sun worshipping temples are not found in many in India and this temple is located in Eravimangalam. There are many other sub deities which include an idol of Devi in the same sanctum sanctorum. The main ritual performed here is the Abhishekam by oil and water. The auspicious day considered in this temple is the last Sundays of the Malayalam month Vrishchikam and Medam. 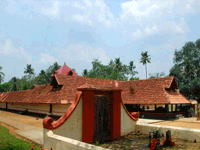 Mahavishnu Temple is located at Thrikodithanam near Changanassery. It is one of the 5 Vishnu temples that are associated with the Pandavas. The legend says that one of the Pandavas, Sahadeva performed the penance at this place. This temple is one of the important pilgrim centers of Vishnu devotees as it is considered as one of the ‘108 Temples & Celestial Abodes of Vishnu’. 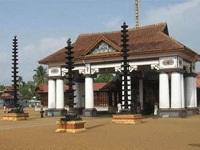 This temple is considered to be ancient and is built in the typical Kerala style architecture. The main festival celebrated here is the Deepam festival held during the months November to December. This temple is located at Chirakkadavu near Kottayam city. It is an ancient temple and is believed to be around 1000 years old. The idol of this temple was created on its own and is called as Swayambhu Siva Lingam. There is a temple tank nearby from where the mud was taken to build the temple. The temple has a huge Balikallu. The Ayyappa devotees on their way to Sabarimala halt at this place and pray at this temple. They consider Chirakadavu Sri Mahadeva as the father of Lord Ayyappan. The main offering at this temple is ‘Meenari’ which is feeding the fish in the temple pond. During festivals the art form ‘Velakali’ is performed from here. 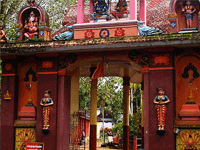 Kumaranalloor Sri Bhagavathy Temple which is also called as Karthiyayani Devi Temple is located in Kumaranalloor near Kottayam city. 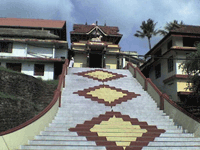 This temple is considered as one of the most important Devi temples among 108 Devi temples in Kerala. It is an ancient temple and is said to be around 2400 years.The structure of Nalambalam and Sreekovil are unique and are built in the Sreechakra Style. The murals in the temple are rare and beautiful. 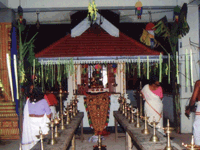 The main festival of this temple is Thrikkarthika which is celebrated in the Malayalam month Vrishchikam. Panachikkadu Saraswathi Temple which is popularly called as the Dakshina Mookambika is located in Panachikkadu at a distance of 11 kms from Kottayam town. The main deity here is Lord Vishnu and there are many sub deities also. The power of Yakshi in this temple is considered to be more when compared to that in other temples. The main festival celebrated here is the Saraswathi Pooja which is held in the Malayalam month Thulam. Thousands of people from all over come to this temple to perform the ritual Vidyarambham during Vijayadashami. 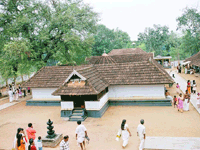 This temple is located at Thururuthy near Changanassery. In this temple there are 21 idols of Lord Ganapathy, but the devotees can see only one idol of Ganapathy. The main ritual performed here is Vigneswara Bali. 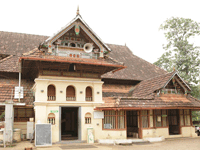 This Shiva temple is around 500 years old and is built by the Thekkumkoor Maharaja. It is constructed in traditional Kerala style architecture and the walls of the temple are decorated with colorful murals. There is a Koothambalam from where cultural programmes are conducted and this is one of the best Koothambalams in Kerala. This temple is located in Erumeli and is a famous Murugan temple. The main deity is Lord Murugan with several sub deities such as Ganapathy, Krishna, Annapoorneshwari etc. It is believed that after executing the Demon Mahishi, Lord Ayyappan reached the Perurthottam forest and had the darshan of Lord Ganapathy. This temple is located near Pala and the idol in this temple is rare. The main idol is a joint idol which has the features of both Lord Siva and Goddess Parvati. Usually in other temples the idols will be located separately. It was an ancient temple and was renovated recently. The annual festival of this temple is held on the 12th and 13th of the Malayalam month Dhanu. The procession during this festival is the main attraction. Suryakalady Mana Maha Ganapathy Devasthanam, Vazhappally Maha Ganapathy Temple, Sree Krishna Swami Temple at Bharanaganam, Vazhappally Mahadeva Temple, Idayattu Bala Ganapathy Temple, Ponkunnam Devi temple, Kizhathadiyoor Puthiyakavu Devi Temple, Ayyappa Temple at Erumeli, Chembittambalam Kizhathadiyoor Thrukkayil Mahadeva Temple, Murikkumpuzha Devi Temple, Manganam Narasimha Swami Temple, Vellappattu Sree Vana Durga Bhagavathy Temple, Thattarakathu Bhagavathy Temple, Thekkumthala Devi Temple, Ooraasala Subrahmanya Swami Temple, Anakkulangara Bhagavathy Temple, Kochidappady Sree Shanmugha swami Temple, Parippu Sree Mahadeva Temple, Kidangoor Maha Ganapathy Temple, Kadappattoor Mahadeva Temple, Puliyannoor Mahadeva Temple, Ambalakkadavu Bhagavathy Temple, Kalkulathukavu Temple, Lalam Mahadeva Temple etc. 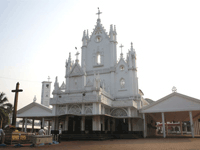 St. Mary’s church is located in Manarcad in Kottayam district. It is also called as Marthamariyam Cathedral. It is believed that the church was constructed around 1000 years back. It is considered to be a very ancient church and there are stone inscriptions here that date back to 10th century. The inscription on these stones is written in Tamil and Malayalam that was used about 600 years back. There are various educational institutions under this church that includes various schools and colleges such as St. Mary’s college, a hospital and other religious institutions. Just opposite to the main church small churches were built. During the feast, Holy Mass will be conducted here and the funeral functions are performed form here. The Cross of the church has been set up in two different places in Kottayam. One on K. K. Road at Maracad junction and another near the Churchyard. Virgin Mary’s birth is celebrated here during the month September starting from 1st to 8th and is called as the Manarcad Perunnal. It includes 8 days fasting and the feast. On the 6th day a procession is carried out which includes several crosses, colorful umbrellas etc. This procession passes through the installed crosses as well as the Small church. During this time, thousands of pilgrims from all parts visit this church. After the noon prayer on 7th an image of Virgin Mary is placed. This is called as the ‘Nata Thurakkal’. During the festival many come here to seek blessings of Virgin Mary and to cure their ailments. They make their offerings to the church. The important feast of this church includes the feast on January 15 to seek the blessing of Mary on agricultural seeds, the feast on February 26 called as the Sunero feast, the feast commemorating St. George on May 6, the feast for the rising of Virgin Mary on August 15th and the feast of Mary’s birth on September 8th. St. Mary’s Valiya Palli which was constructed in the year 1550 is also called as Syrian Knanaya Church. 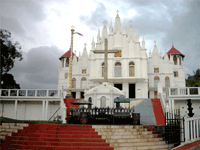 This church is located at a distance of 2 kms from Kottayam town. It is one of the oldest churches in Kerala and it was built by the successors of Syrian Knanaya. They were the people who have migrated from Jerusalem to India. The church is famous for the 2 Persian crosses that are made of granite with Pahalavi inscriptions in it. The church architecture is also very beautiful. The annual festival held here is the Feast of Valiyapalli and is conducted on April 26th. 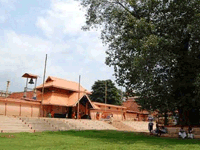 St. Mary’s Cheriya Palli is located near to the Valiya Palli. 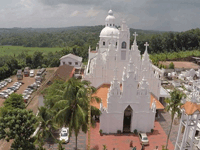 The name of the church is St. Mary’s Orthodox Syrian Church and is popularly called as Kottayam Cheriya Palli. The murals and paintings in this church are very attractive. The two main annual festivals are the Feast of St. Mary’s held on January 15 th and the Feast of Assumption of Mary on August 15 th. The 2 churches under the jurisdiction of Cheriya Palli are Puthenpalli and Kurishupalli. St. George Orthodox Church which is also called as Puthupally Palli or Puthupally Valiyapalli is located in Puthupally. 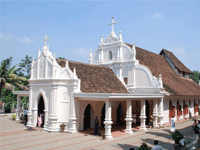 It one of the main churches of the Malankara Orthodox Church and the patron saint is St. George. 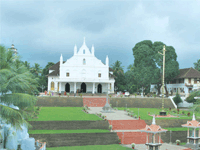 This church was initially established as a Kochu Pally with name St. Mary’s in the year 1557 near Vazhakkulam. Later it was shifted to the present location and was renamed as St. George. The shrine which is at present is declared as the ‘Georgian Pilgrim centre of the East’. St.John's Orthodox Syrian Church which is also called as Vakathanam Valiya Palli is at Vakathanam in Kottayam. 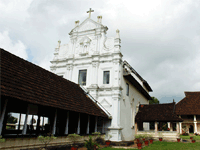 It is one of the oldest churches in Kerala and was built in the year 1847. Vakathanam is a major centre of the Orthodox Christians and this church is considered as the “Thalapally” of all the Parishes in this village. 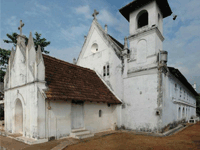 Holy Cross Forane Church is located at Cherpunkal. Initially the church was built at Moonupedika in Kummannoor and was then later reconstructed at the current location. The church was built in Gothic architecture and is a real monument. There is a statue of infant Jesus placed in the porch and also a Nilavilakku is kept in front of it. Thousands of devotees come to this church on the first Friday of every month to pour oil to the ‘Ever burning lamp’ and worship. The main festival held is the Feast of Infant Jesus which is conducted in the 31st of December and 1st January. 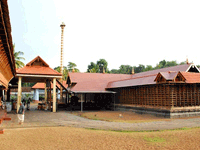 Bharananganam is one of the ancient centers of Christianity in Kerala and is also a major pilgrim center. 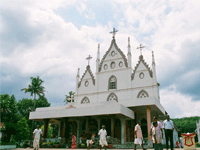 St. Mary’s church is one of the important churches in Kerala located at Bharananganam. It is also called as Anakkallu Palli. This church has great significance as the mortal remains of Saint Alphonsa are kept here. Near to the church lies the convent where Saint Alphonsa lived and died; the tomb of Saint Alphonsa and also the Alphonsa Museum. The main festival celebrated here is the Death Anniversary of Saint Alphonsa on 28th of July. 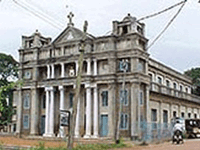 It is an ancient church in Kottayam which was constructed in the year 1882. The church was then renovated in 1964. The architecture of the church is in Italian designs and styles. The main festival held here is the Annual feast of Good Shepherd church celebrated between 10th and 12th of April. The Feast of St. Sebastian is also celebrated here. Christ the King Cathedral of Kottayam Archdiocese, Lourdes Forane Church, Vimalagiri Church also called as Angathattu Palli, St. Joseph's Monastery at Mannanam, St. George’s Church at Aruvithara, Kaduthuruthi Valiapalli, St. Thomas Mount etc. Vavar was a Muslim friend of Lord Ayyappa and a mosque called Vavar palli has been dedicated to him at Erumeli in Kottayam. Irrtespective of the religions, the pilgrims who come to Sabarimala will also make it a point to visit the Vavar palli and offer prayers from here. This mosque lies next to an Ayyappa temple and is an example of the religious and communal harmony of this area. The legend says that Lord Ayyappa himself has suggested building a mosque for Vavar at Erumeli. 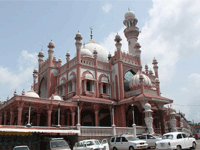 Thazhathangady Juma Masjid is located in Thazhathangady on the banks of the river Meenachil in Kottayam. This mosque is also called as Taj Juma Masjid. It is one of the oldest mosques in India. The architecture and the wood carvings in the interior of the mosque are very attractive and beautiful. The Nombuthura function which is conducted in the mosque during Ramadan is very important. 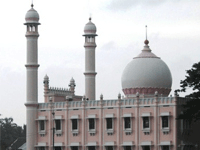 Puthoorpally Juma Masjid is located in Changanasseri. This is an ancient mosque and is believed to be built around 600 years back. Puthoorpally ‘Jama-ath’ is one of the largest in Kerala. Pazhayapalli is an old mosque in Changanasseri and is around 950 years old. The annual festival 'celebrated in this mosque is the ‘Thangal Adiyanthiram’ and a grand feast is also prepared. Another mosque called as Puthurpalli is also in Changanasseri and it is 400 years old. The Chandanakudam festival of this mosque is very famous and it attracts large number of devotees. 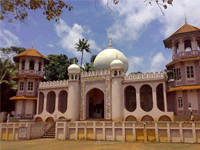 Another important Muslim pilgrim centre in Kottayam is the Erattupetta Mosque.